1credit: Break code gate subroutine. 1credit: +1 strength for the remainder of this run. It can slice through the thickest knots of data. 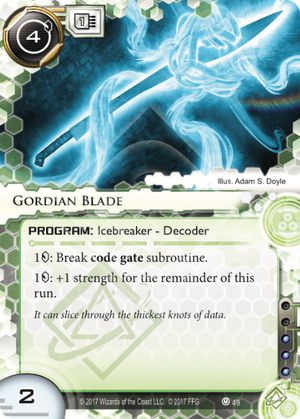 Featured in many tournament winning decks, Gordian Blade is one of the most powerful breakers in the game. It has the combination that everyone loves: 1, 1 to pump, 1 to break. It's reasonably efficient for early game (e.g. Enigma), high subroutine (e.g. Merlin), and high strength (e.g. Tollbooth) Code Gates. The Blade is not as weak as ZU.13 Key Master, not as expensive as Torch, doesn't require stealth (unlike Refractor), can be pumped to infinity (unlike Yog.0), and is not limited to a single server (unlike Cyber-Cypher). Like all great hacking tools, it is flexible, efficient, and elegant. If you are only putting one Decoder in your deck, it is a solid choice. Long ago, an oracle decreed that the next man to enter the Phrygian capital (modern Turkey) should become king. Gordias, a peasant, drove into town on an ox-cart, and was declared the ruler. Out of gratitude, his son dedicated the ox-cart to Zeus, and tied it to a post in the palace with an intricate knot that had no exposed ends ("GORDIAN Knot"). The cart stood unmoved for generations. It was, in fact, still there when Alexander the Great arrived. Alexander attempted to untie the knot, but could not find the ends. Instead, he sliced it in half with a stroke of his sword-er, wait, I mean, BLADE. Once Alexander moved the cart, an oracle further prophesied that the one to untie the knot would become king of Asia (... and win a Fantasy Flight game mat). The mid-costed version of the series of shaper decoders that cost 1, boost strength for 1 and break subroutines for 1 with no further restrictions. Gordian Blade strikes a pretty good middle ground between cost to install and cost per run. ZU.13 Key Master: 1 install cost, 1 base strength. Bonus: 0 cost if you have at least 2. Gordian Blade: 4 install cost, 2 base strength. Bonus: Keep boosted strength for the rest of the run. Torch: 9 install cost, 4 base strength. While specialized decoders exist that are more efficient in specific setups, either of these will get you through any code gate you encounter for a reasonable amount of credits without any extra support. If there are multiple code gates protecting a single server, you get extra value from Gordian Blade keeping its boosted strength for the rest of the run. Rielle "Kit" Peddler: Transhuman: Identity. The first piece of ICE you encounter each turn gains code gate. Tinkering: Event. One piece of ICE gains code gate/barrier/sentry until end of turn. Paintbrush: 2 program. : One piece of ICE gains code gate, barrier or sentry until end of next run. Escher: Run event. If you make a successful run on HQ, rearrange the ICE protecting all servers.